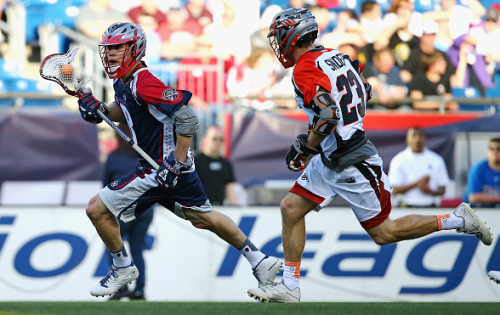 The Denver Outlaws started their title defense on Sunday night in Boston, but coming up on the losing side of a 16-13 decision surely was not what coach B.J. O’Hara and his team had in mind. It’s worth mentioning again that eight of the players on the Outlaws’ 25 man active roster are playing NLL right now. That’s less of an excuse for the loss than it is context for how well the team played without some of its biggest stars. Several things stood out in Boston game, but here’s what caught my eye. One of Denver’s strengths has been its willingness to use historically offensively minded midfielders on the other end of the field. Drew Snider is a great example of this as he takes plenty on shifts at both ends of the field. This helps to stifle transition for opponents. When the field flips to offense the Outlaws don’t have to spend as much time substituting and can get good looks from their top players before opponents have the personnel they want on the field. In particular, Pat Harbeson, who earned his stripes as a SSDM at Virginia, played a solid game for the Outlaws. He was able to push transition and help generate some offense as well, notching a goal and an assist. Harbeson stands out because of his short stature but he plays much larger. Not everyone shows up in the box score at the end of the game, especially SSDMs, which is why Noah Molnar’s play warrants mentioning. If there was a hustle defensive stat Molnar would have had pretty good numbers against Boston. Molnar maximized his runs; he wasn’t a liability and helped in the clearing game as well. The Sutters of the MLL? There are three Bocklet brothers on the Outlaws roster and all three suited up on Sunday. This has to be some kind of record, right? Both of the offensively-minded brothers—Chris and Mike—scored in the contest. The youngest Bocklet (Chris) had a hat trick in the first half. The game of lacrosse is no stranger to storied families (like the Sutters in the NHL), e.g., the Powells, the Stanwicks, but all three getting serious minutes on the same team is pretty unique. The fact that they’re all contributing speaks volumes about their talent too. The defense looked to be a work in progress. There were a few goals that came as a result of late slides and missed assignments. On one of Boston’s goal two different Outlaws defenders half committed to sliding to the eventual goal scorer and that miscommunication cost the team. Going in to the half O’Hara said his team needed to step up the physicality on the defensive end and the team responded in kind. No one ever needs to tell Dillon Roy to lay the lumber, but Ethan Veddar and Ken Clausen looked good in the second half. Jesse Schwartzman had an ok game. It seemed like he wasn’t seeing the ball very well and didn’t get the saves the team needed. The turning point in the game came in the third period when Boston scored back-to-back two point goals. Both caught Schwartzman and the defense sleeping, which I could understand to some extent with the first one from Rob Emery. But Josh Amidon did the exact same thing twenty seconds later. Fool me once shame on you, fool me twice… well… you know. All told the Outlaws played a decent game. Yes, there was a bit of rust but everyone stepped up their game in the absence of so many active roster players. Justin Pennington deserves specific mention in this case with his second-half hat trick and an assist to boot. Newcomer Greg Melaugh contributed a nice low-to-high snipe around his defender in the second quarter to close the gap to 5-4. Again, there’s should be no panic in Denver at this point. The 20-second span that netted the Cannons two two-point goals was the real difference maker here. Otherwise the teams looked pretty evenly matched throughout the contest, which, with the level of talent in this league is to be expected more often than not.